What Made the Popcorn Go Pop? A little play on words in the title there. I must be a really hungry blogger to write another post about food. At the movies, it is iconic to grab a bag of popcorn to munch on during the film. Just the other day, I grabbed a bag and watched “Journey to the South Pacific”, a science IMAX film at the aquarium (great documentary!!). Waiting for the movie to start, I questioned: what makes a popcorn a popcorn? How does corn turn into popcorn? Let’s start with the corn plant first. Popping corn is not the same variety as the corn you eat on the cob. What you eat on the cob is sweet corn (Zea mays var. saccharata), bred for its sweetness and tenderness. Popping corn (Zea mays var. everta) is specifically bred for popping; it has a soft starchy center surrounded by a very hard exterior shell. How did popping corn become popular? Popcorn was probably an important part of the ancient Americas for culture and for diet. There are many old paintings, artworks, and artifacts that depict people wearing a headdress or decorated pieces of popcorn. 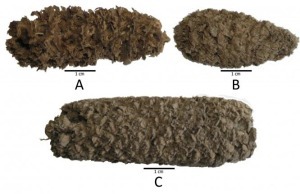 Scientists found fossilized popping corn in Peru dating back to as early as 4,700 BCE. The corn was so well preserved that it still popped! Native Americans brought popcorn to the first Thanksgiving; the common way to eat popcorn at that time was to hold an oiled ear of a corn on a stick over the fire, then chew the popped kernels off it. Popcorn became very popular in the United States from the late 19th century through the middle of the 20th century. During the Great Depression, popcorn was fairly inexpensive at 5–10 cents a bag. With the invention of talking movies, munching popcorn during a movie just made sense. And while other businesses failed, the popcorn business thrived and became a source of income for many struggling farmers. During World War II, when sugar was rationed, Americans also changed their snacking habits—eating three times as much popcorn as they had before. Today, the average American eats nearly 70 quarts of popcorn a year. At the first Thanksgiving Native Americans bought popcorn; the common way to eat popcorn at that time was to hold an oiled ear on a stick over the fire, then chew the popped kernels off it. What makes a popcorn pop? 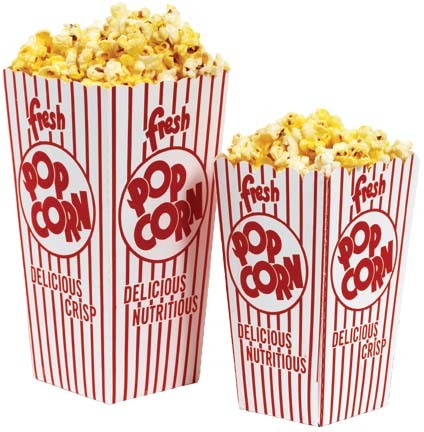 Popcorn is a whole grain and is made up of three main components: the germ, endosperm, and pericarp (or hull). Inside its starchy center, each kernel of popcorn has a small amount of water and oil. As a popcorn kernel is heated, the water inside expands as it turns into steam. At low temperatures, below 100 °F, the water cannot escape through the thick hull. However, when it is just hot enough (try 200 °F) the water turns into steam and changes the starch inside each kernel into a super-hot gelatinous goop, making it soft and pliable. As it continues to get hotter (now 300 °F), the pressure inside the kernel is just right to rupture the thick popcorn hull, bursting it open, and turning inside out. As it explodes, steam inside the kernel is released. The soft starch inside the popcorn becomes inflated and spills out, cooling immediately, and forming into the odd white foam shapes we know and love. 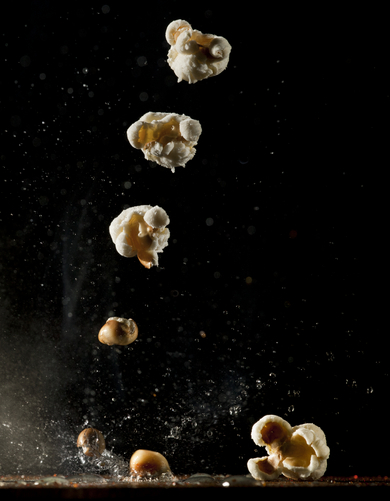 Check out this cool video of a kernel of popcorn popping in slow motion. So the next time you go to the movies and grab a bag of popcorn, think about what it took to make that popcorn go pop! Now, who says science can’t be tasty?